The boys continue to search for a way off of the prison planet with the help of Joker Jnr. Damien captures a couple of Rex's cronies, with the help of a young Green Lantern Cadet that he rescued last issue. 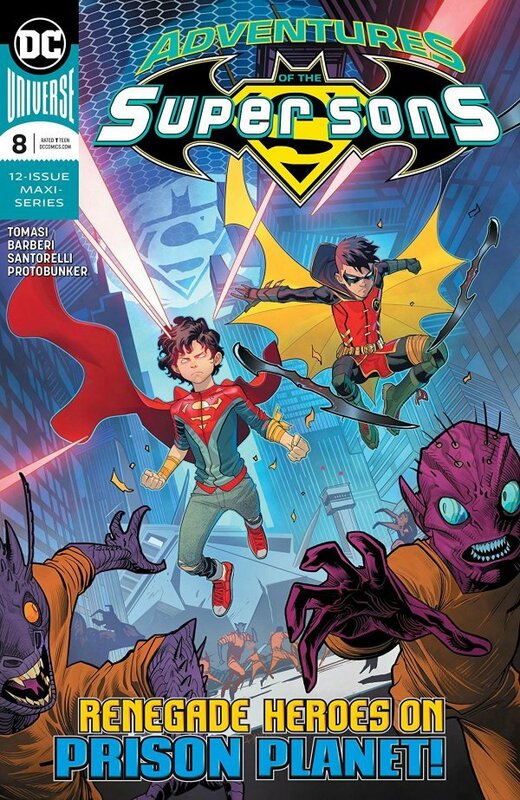 Rex manages to grow his army, and tries one last time to destroy the Super Sons, but when he fails, he washes his hands of them, so that he can concentrate on taking over the galaxy. "Gather the rest of the... Injustice Army... The Super Sons are someone else's problem now" - Rex Luthor. Story - 5: This was a great follow up to last month's issue, with the boys trying to escape the prison planet. The boys almost take a back seat to Rex and Joker Jnr this issue, which wasn't a bad thing at all. As we get to see Rex expand his plans to take power and control of the galaxy. I really loved the way Tomasi called back to a previous issue, where he introduced a character that came into play this month, with the GL Cadet. Having a background with the GL fiefdom, Tomasi has a large arsenal of characters in his belt he can tap into, and the prospect of the boys on OA next issue has me very excited. There was a moment in this issue that teased a possible friendship between Rex and Joker Jnr, from their own past. I hope Tomasi explores this later, though it seems that Joker Jnr may have made his final appearance, as he seems to have murdered by Rex. I'm excited to see what happens in the coming issues, to see what Rex has planned and how the boys will plan to stop him. This is one of the best books on the stands still, and though there is only 3 issues to go, Its still one of the books I look forward to each month. Art - 5: Carlo Barberi has done what very few artists manage to do, which is keep the same level of energy, quality and sense of fun, along without doing what he did in the previous issue. He uses the modern medium to his advantage, with digital inking and coloring techniques, giving him enough leeway to use the negative space to his advantage. The splash on pages 4 & 5 featuring the amazing ensemble of Rex Luthor's army of kid villains is amazing. I would love to own this original piece of art. I can only imagine that without the color, it could and would look and take on a completely different context. I just fell in love with this page. I still love the way he draws Jon, and the facial expressions he gives him. His hair is a character in its own right at times, much like the Neal Adams used to describe Batman's cape. The same can be said regarding Damien's cape, Barberi finds new and unique ways for it to flow, sit and settle. Other than the many aliens and kid bad guys that Barberi rendered, I love the way he drew Rex Luthor and his armor, but nothing more than the "Kirby-Crackle" he gave Rex when he attacked the guards. The art is such a good bonus to the amazing writing. What more can I say about Protobunker's, other than, without them, the art would look flat and somewhat lifeless. Cover Art - 5: Dan Mora's covers just make me want to see him tackle the interiors. Love the composition for this cover, as the boys unleash and the bad guy (aliens) run for cover.